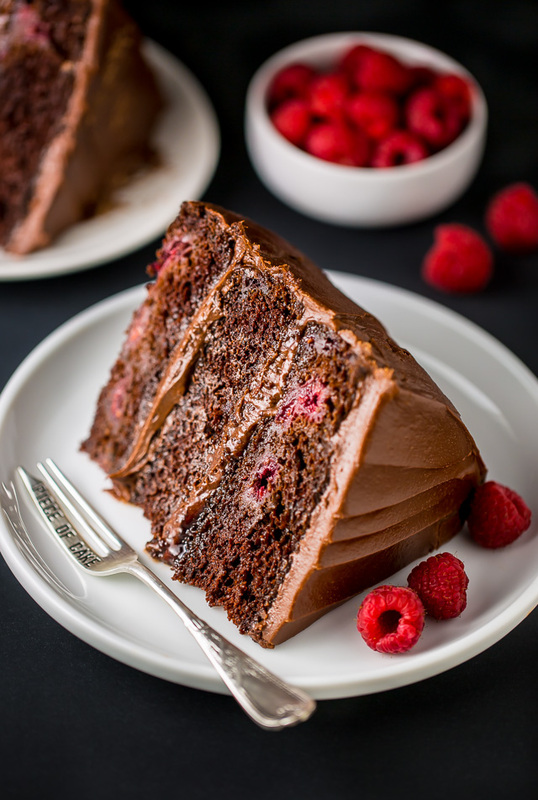 This Triple Layer Chocolate Raspberry Cake is a SHOWSTOPPER! Top with fresh raspberries for an extra lovely presentation. TGIF! We made it. What are your weekend plans?! Baking anything special? Watching anything fun on Netflix?! 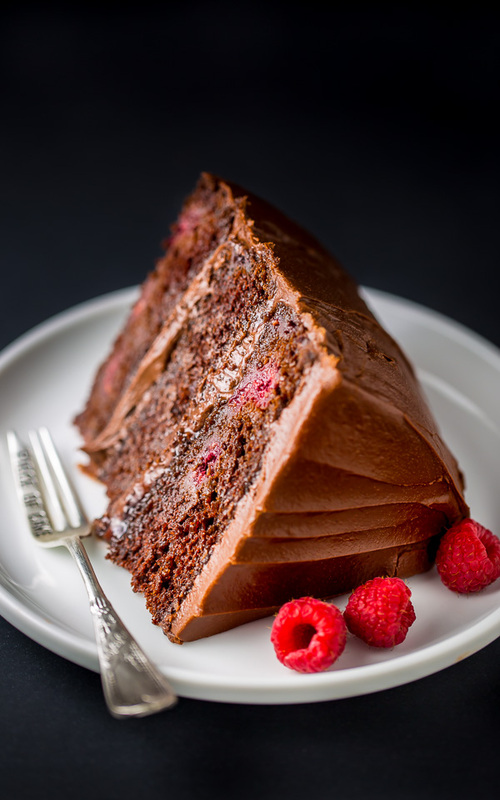 Which is where this beautiful chocolate raspberry cake comes in! I’ve been dying to try a chocolate raspberry cake and I’m SO happy to report the flavor combination is a total winner. 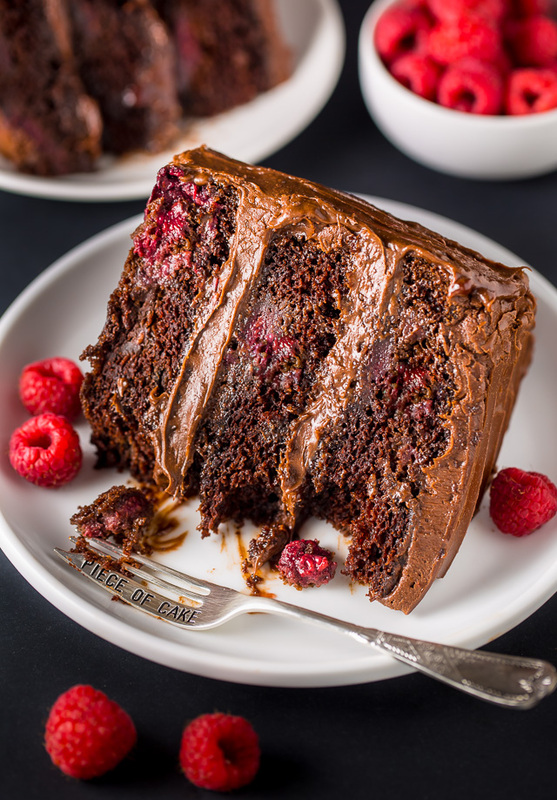 The chocolate cake layers are rich, moist, and bursting with fresh raspberries; the chocolate frosting is thick and creamy; and the layer of raspberries preserves ties everything together! I suggest topping the cake with extra raspberries and chocolate shavings for a breathtaking presentation. Because is there anything more delicious than chocolate with raspberries?! You must toss the raspberries in all-purpose flour before adding them to the batter. This dusting of flour helps keep the berries afloat during the baking process, and ensure you won’t slice into a cake full of sunken berries. You may use fresh or frozen raspberries for this cake. If you use frozen, don’t thaw them first. I used store bought raspberry preserves in this recipe, but feel free to use homemade if you’d like! For the chocolate raspberry cream cheese frosting, you’ll want to make sure your butter and cream cheese are both VERY soft before creaming it. The cakes should be completely cooled before adding the frosting and raspberry preserves. The assembly is a two part process: you’ll place one cake level on a large plate, top it with a thin layer of frosting, then add the raspberry preserves, then add another cake level and repeat. Once you’ve added the final cake level you’ll want to leave the top bare and place the cake in the fridge to set for about 30 minutes. Once it’s set, you can finish frosting it and add the edible decorations. 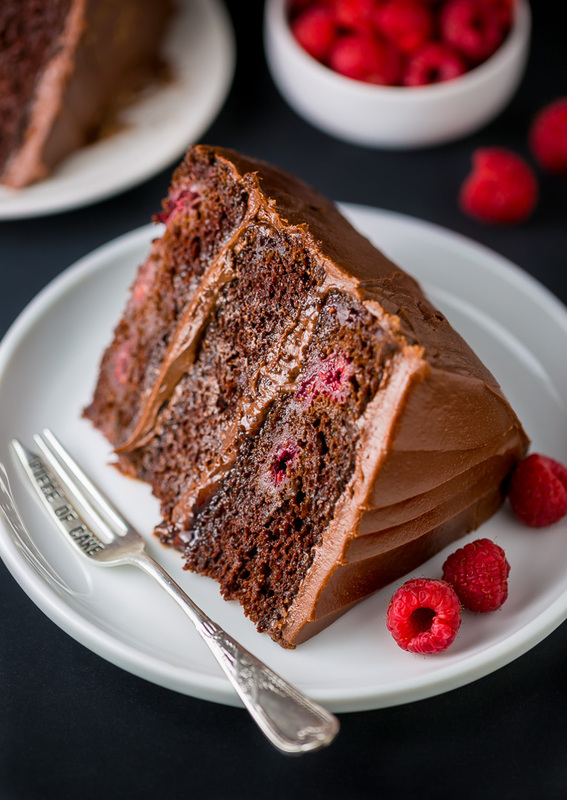 This Triple Layer Chocolate Raspberry Cake is a SHOWSTOPPER! In the bowl of a stand mixer fitted with the paddle attachment, or in a large bowl using a handheld electric mixer, combine both sugars, 2 and 3/4 cups of the flour, cocoa powder, baking soda, baking powder and salt; mix on low until dry ingredients are thoroughly combined. Use your hands to break up any large clumps, if needed. In a separate bowl combine the eggs, egg yolks, sour cream, milk, oil and vanilla extract; mix until completely combined. Pour mixture into the dry ingredients and beat on low until just incorporated. 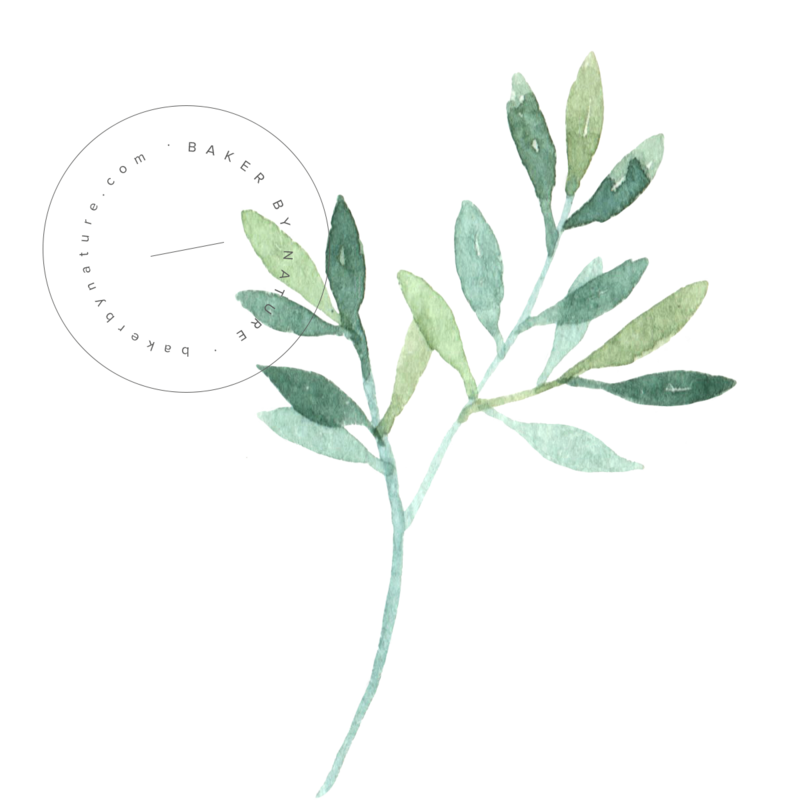 Pour in hot water and continue mixing until completely combined; about 1 minute. The batter will quite thin. In a medium bowl, gently toss the raspberries with remaining 2 tablespoons of flour. Add the raspberries, and any remaining flour, into the batter and fold in by hand, using a rubber spatula, until just combined. Again, be sure not to over mix! Over mixing is very easy to do, and will result in a dry, dense cake. Divide batter evenly among prepared pans. Bake in preheated oven for 30 minutes, or until a wooden toothpick or cake tester inserted in the center of a cake comes out clean or with just a few moist crumbs attached. Cool cakes for 10 minutes in the pan before removing from pans and transferring to a cooling rack; cool cakes completely before frosting. In a stand mixer fitted with the paddle attachment, beat the cream cheese and butter on medium-speed until completely smooth; about 3 minutes. Turn the mixer off and sift the powdered sugar and cocoa powder into the mixing bowl. Turn the mixer on the lowest speed and mix until the sugar/cocoa have been absorbed by the butter; about 2 minutes. Increase mixer speed to medium; add in vanilla extract, salt, heavy cream and raspberry preserves; beat for 3 minutes. If your frosting appears too thin, add a little more confectioners' sugar; If your frosting appears too thick, add additional heavy cream, 1 tablespoon at a time. Using a serrated knife, carefully trim the raised top of each cake, making each one an even, level surface. Transfer 1 layer to a large plate or cake stand. Spread a layer of frosting on top, then spread a 1/4 cup of raspberry preserves on top. Don't worry if they blend together a little! Top with another cake layer, and repeat, spreading it with a layer of frosting, then adding remaining 1/4 cup of raspberry preserves. Top with final cake layer and place cake in the fridge to set for 30 minutes. Once set, finishing frosting the top and sides of the cake. Garnish with fresh raspberries and chocolate shavings. Slice and serve, or keep refrigerated for up to 3 days. Chocolate and raspberry! Perfect combination! 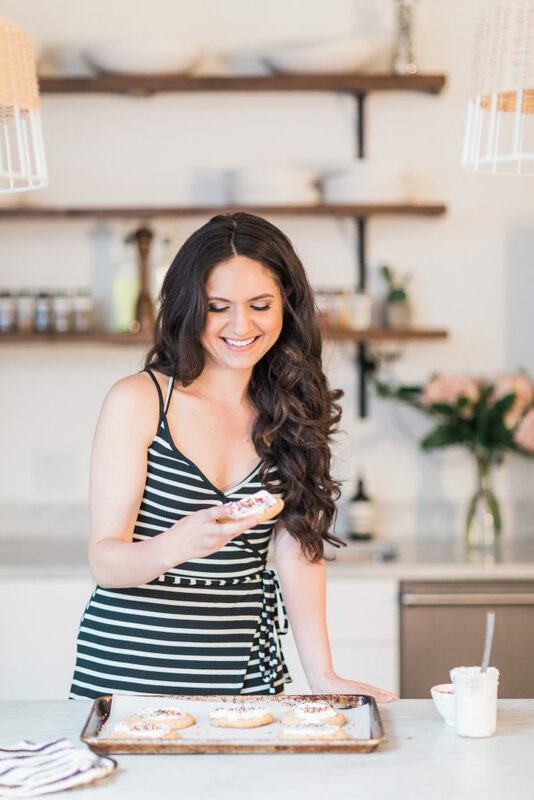 I made this over the weekend and it was such a great recipe – thank you! Hello! Could I make mini cupcakes with this recipe? Thank you. Hi again! I ll try to make this cake . But do you mix the raspberry jam in the chocolate frosting ? Did I get that right ? I haven’t tried it yet as it is for a cake war with my students but I replaced the raspberries with pomegranate and I can’t wait to see how it turns out. I still tossed them in flour so here’s to hoping it’s a show stopper as well! My son requested a chocolate and raspberry cake for his fourth birthday, so I gave this one a go, and everyone loved it! I just made two layers so took an extra ten minutes in the oven. Cooked perfectly so there was no need to cut the cake flat before icing. Will definitely put this one away for future use, thank you! So, I just made this for my husbands birthday. He wanted a chocolate cake with raspberries in it as well as in the icing. I’m not typically a huge fan of raspberries, but it’s his birthday so I made it anyway. I’m lactose intolerant and can only handle a tiny bit of dairy, so I used daiya cream cheese substitute and soy yogurt mixed with baking soda as a sub for sour cream. Almond milk was used in place of whole milk. Sometimes this messes things up, so my hopes weren’t all that hight. Other than that, I followed your recipe to a T.
Let me tell you, we gobbled this up. We took some to our neighbors and they gobbled it up (didn’t tell them about the substitutions). The cake was moist, the buttercream not too sweet, the touch of raspberries wasn’t overwhelming – it was perfect. He asked for this to be his cake for every birthday from here on out. Thank you so much. Made cake for a friend’s birthday. Received several comments on how moist the cake was and the icing was excellent. Now others are asking I make the cake for their birthday. Thank you Sharing the recipe. One guest even commented I lived up to my email address. Hey there! I’ve already made the cakes and put them in the freezer, what I taste delicious of them were fantastic! It’s for my moms wedding next week! I’m wondering how stiff the frosting is or isn’t (they wanted the frosting from this recipe) and what I should be expecting for decorating. Thanks! I like to bake for the faculty at my grandchildren’s school, and I’ve learned to simplify the process by making sheet cakes [9×13” pans]. Big group of 70+, and I’m old! Any tips? I know it won’t be as good as your layers. Hello! This cake looks delicious and wanting to make for Christmas. How many does this recipe serve? I would love to make this for Christmas. Is there any substitute to not adding the cream cheese to the frosting? My mother isn’t a fan of the taste, and I am afraid she will know if I use it. Thanks! Hi. Can I freeze the sponge without icing and thaw it when I want to ice it? I am planning to make this cake But need to do it in 2 stages – a few days apart. I made this for my sister’s engagement party and it was so perfect! I only wanted to do 2 layers, so I baked it a little longer and left everything else the same. The cake was dense yet moist, the raspberry flavor was delightfully subtle but still noticeable through the intense chocolate flavor. Absolutely delightful. When she requested something with chocolate and raspberry I knew you would have just the right recipe! Thanks for helping me deliver the perfect celebration cake!